"Jungfraujoch Top of Europe Festival"
Seoul, Sept. 8, 2005 — This weekend and indeed all of next week, the Seoul Hilton Hotel is getting ready for lots of Swiss fuelled mania. The "Jungfraujoch Top of Europe Festival" kicks off this Friday (Sept. 9, 2005) and runs till the following Sunday (Sept. 18, 2005). The "Jungfraujoch" being an unforgettable Alpine tour to the majestic world of the Jungfraujoch, The Top of Europe. At 3,454 meters or 11,333 feet, it's the world's highest railway station. Switzerland is the world's oldest democracy, their taste for freedom is surpassed only in their taste for the freshest and best ingredients to put in their pots. Swiss cuisine is an amalgamation of multinational cuisines that blends the best from their neighbors, Italy, France, Germany, Austria, Lichenstein. Expect lots of fresh fish, sausages, cheeses and of course chocolate. Nowhere in Switzerland is more than 10 miles away from a lake, so there's always a large selection from which to choose when eating at a Swiss table. There'll be bratwurst, weisswurst, wieners and many other sausages on which to gorge. And of course there'll be fondue, a delicious blend of cheeses, wine and seasoning. Expect this most Swiss of meals to be a blend of either Emmental, Gruyere, Vacherin and Appenzeller cheeses. Oddly its popularity is owed to the Swiss Cheese Union, who used this once regional dish to boost cheese sales. It certainly succeeded. So this weekend why not sit and enjoy a bubbling caquelon of fondue over a glass or two of fine Swiss wine? 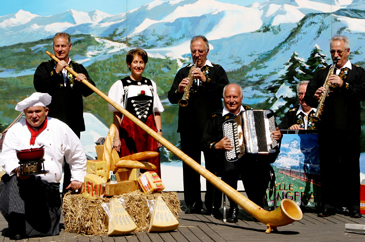 There's a live six-piece Swiss Folk Band so you can work off all that fondue jigging to accordions and violins. There's also prize draws. So you might even dance away with your very own fondue set! The Swiss festivals guest chef is Ruedi Wittwer. There will be a buffet restarant, and a varied assortment of fondues and set menus to be enjoyed in the Atrium Caf.